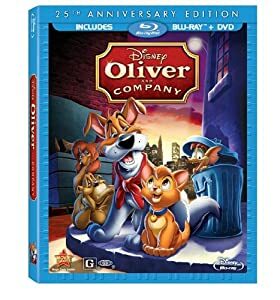 Celebrate the 25th anniversary of a Disney classic with the stunning Blu-ray debut of Oliver & Company , featuring perfect picture and sound. Relive this charming animated adventure, packed with excitement, fun and unforgettable songs by Billy Joel, Bette Midler and Huey Lewis. I loved this movie in the past and Disney has done a great job bringing this movie back in great high definition on this new Blu-ray. I have always been a fan of the Oliver Twist story so Disney did a great job turning that story into a great new one with character that you will simply adore and some great actors/singers behind the voices as well. You get to see the underbelly of New York and go along on a great adventure too. My daughter had not seen this before so they really enjoyed it. I think they also enjoyed it because I was able to tell them that they were hearing some singers that we have helped them get to know as well. All-in-all this was a great new release and whether you have seen it before or not, I encourage you to pick up this new blu-ray today - you won't be disappointed!